The question we get most this time of year is “how do you harvest pecans?” The short answer is that we shake trees and pick up nuts. The long(er) answer is a laundry list of tractors that help us get pecans from the top of the trees and into the fryer. We are currently in the throes of harvest season. It’s slow business; we’ve experienced severe hurricane damage and now over a week in rain delays. We’ve had so much rain that you’ll notice a lot of these photos of machinery are taken under a shelter, rather than in use. But if we can get a few hours of sunlight to dry the wet mud enough to run a machine over it, somebody is back on the tractor with gumption. Having spent 70 years in the John Deere tractor business, our family is particularly fond of the equipment, and it’s fitting to share just a bit about what they do. 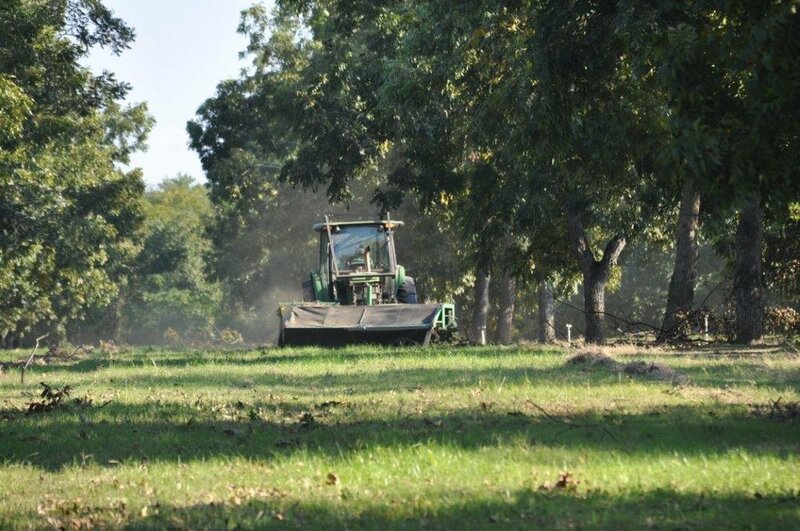 Consider this an introductory guide to the ins and outs of pecan harvest and the impressive machines imperative for agriculture. Pecans are ready for harvest when the green husks are beginning to open. The nuts will visibly weigh down a tree with a good crop, with the top boughs bending down away from each other. The shaker, on a colder day than today, shaking his little heart out. The first step of harvesting is to shake the nuts off the trees. The shaker does this in the most literal way, having an arm that reaches out and clamps the tree before shaking its little heart. Truly the shaker is the piece of harvesting equipment most readily adaptable for a heartwarming Pixar film. Next a tractor with sweeper and blower attached drives through. 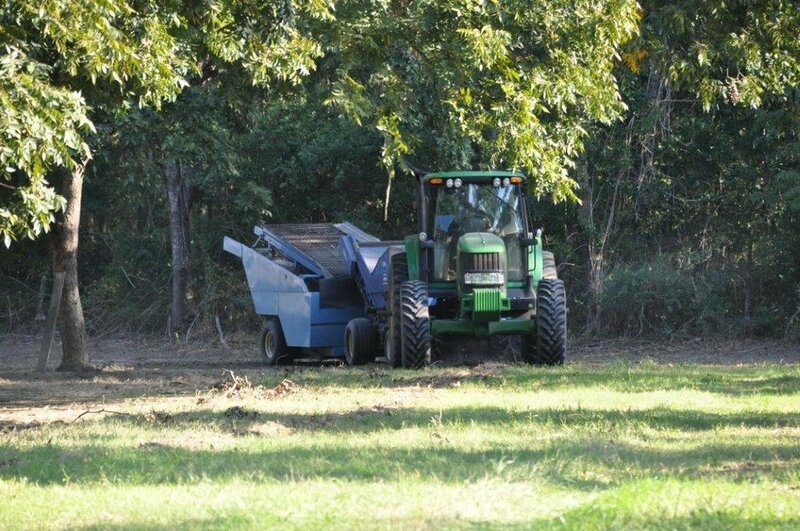 First, the blower, attached to the back of the tractor, blows the pecans away from the trees to make the nuts accessible for the sweeper. Then the sweeper drives through and blows the nuts from the opposite direction, which forms neat windrows. This may take anywhere from four to six passes through to form rows efficient for the harvester. Into these rows the machine also blows leaves, dirt, and rogue limbs, the larger of which have to be removed by hand. Farmhands walk up and down the long windrows, tossing any branches big enough to wreak havoc on the machinery. Finally comes the harvester, which drives over the windrows and blows the pecans into its wagon. This machine uses a conveyor system with a giant fan to separate nuts from anything heavier. The nuts are deposited into a wagon, ready to be cleaned and shelled. Alongside the normal process of harvesting, we are simultaneously continuing to clear Hurricane Michael’s destruction. 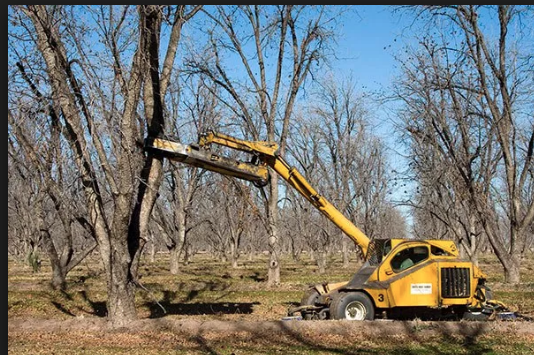 A skid steer fronted with a limb grapple carries limbs, while a 40 foot lift platform gets into the top of the trees to cut out hanging limbs, or “widow makers.” And burn piles dotting the orchard are manned by the backhoe, quickly disposing of limbs that were in the way. Many of you have asked why we don’t save the timber. Since we have near enough debris to fill a stadium, we have to get it out of the way of the harvester ASAP. And with so many other people with trees down, there’s little demand for our lumber. We’ve saved firewood for ourselves, and welcome people to come get their own. Our pecans are mercifully ready for purchase now. It’s been a hectic season, but as always the best is yet to come. Thank you all for your continued support!